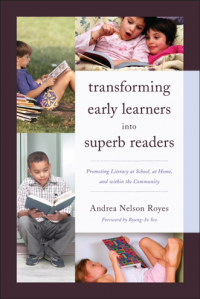 Andrea Nelson-Royes, EdD, an educator, researcher, author, and parent who has a passionate interest in how children learn to read and how to keep them reading, has authored a book that demonstrates all that she has experienced and believes in; Transforming Early Learners into Superb Readers: Promoting Literacy at School, at Home, and within the Community. It starts for her at home with her own children, endeavoring to give them the opportunity at the best possible education that they can get. Being a mother of four children gives her ample time and opportunity to test her passion for the education of other parent’s children.